New to the Knapp Center as of Spring 2014, Maker tools have been added to the existing equipment available for use by students, faculty, and staff. Makerbot 3D Printers, NextEngine 3D Scanners, 24” Cintiq Monitors, Leap Motion Controllers, and Microsoft Kinects are some of the first tools we’re rolling out over the course of the Spring semester. Several course-related projects have already begun to employ these tools. 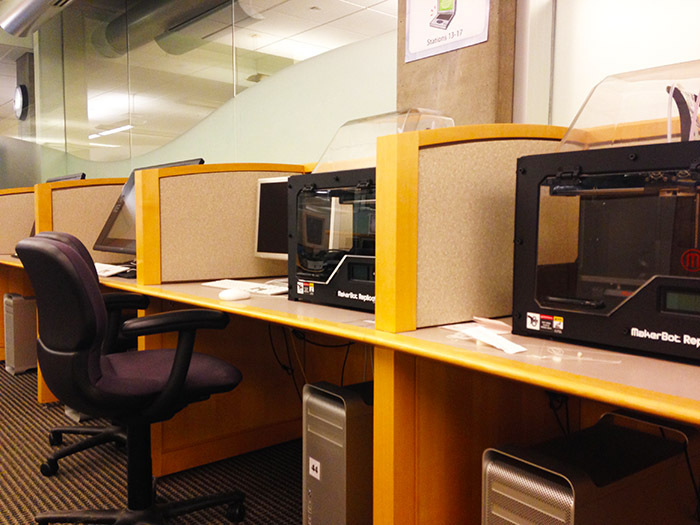 Students are using 3D printers to create physical objects from their own designs. Touchscreen technology is enhancing workflows for all kinds of imaging projects. Microsoft Kinects are being used to manipulate live video imagery. 3D scanners can make a digital archive from nearly any object. This list describes just some of the first uses discovered for these tools. Many more applications will be implemented by anyone interesting in Making their project come to fruition!